gets, or mines, clay shale used in manufacture of alum. a gypsum miner q.v. who drills holes (usually with hand augur), charges and fires them, and often wards up rock loosened by explosion; frequently is also chargeman of small gang of miners; cf. quarrier (072). tends self-acting incline, i.e., a tramway worked by gravity, on which descending full tubs or trams draw up empty ones. dries barytes, and grinds it, either between several pairs of revolving burr stones, or in a pulverising mill; sorts it by floating in water, in which coarser particles settle, while finer remain in suspension; dries by steam-heat, and packs in barrels for despatch. picks over gypsum, after it has been quarried, with a pick, to remove foreign substances; sorts gypsum according to quality. fills loose rock-salt into trucks and conveys it to shaft for winding. works at rock face "getting" mineral, e.g., rock salt, barytes, etc., in a mine or quarry, by hewing, drilling or blasting; cf. miner. a getter q.v. in rock salt mining. tends grinding plant which reduces barytes to fine powder. sometimes specifically designated according to substance mined, e.g., alum miner, amber miner, barytes (cauk) miner, ganister miner, gypsum miner, ochre miner, quartz miner, rock salt miner, spar miner. general term for any worker in or about mines, such as alum, barium, barytes, calamine, felspar, fluor spar, jet, mellite, ochre, plaster or gypsum, quartz mines. assists steam navvy driver (950) q.v. in excavation work in quarries of gypsum, ironstone, etc., directing operations by signals. works underground, sorting out various qualities of rock salt. does any unskilled work in pit or quarry, e.g., signalling to enginemen, pushing trucks, cleaning and sweeping roadways, loading trucks. general term for any person employed in quarry or pit, including digger, getter, filler, loader, miner. 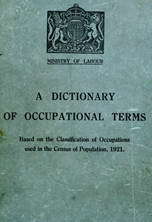 general term for all persons employed in quarries. lays and repairs roads in mines and quarries, sometimes also lays rails; cf. platelayer (577). is responsible for maintenance of shafts in salt mine. detaches tubs of rock salt from haulage chain when they reach surface. a quarryman q.v. digging or blasting for strontionite. general term for any person employed in a strontia mine or quarry.